So just who are "his people"? Who belongs to Jesus and is, therefore, saved? 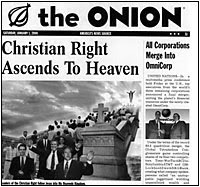 TULSA, OK -- At the stroke of midnight, Jan. 1, 2000, the clouds opened above the Bible Belt and a golden staircase appeared for all born-again Christians who do not bear the Mark of the Beast to ascend into Heaven and enjoy Everlasting Salvation. Night turned to day as Jesus Christ appeared at the top of the staircase in a blinding white sun-beam to select only 1,000 believers for ascension into Heaven, as outlined in the Book of Revelation. "Follow Me," the bearded, unkempt Jew told His assembled flock as He unrolled a papyrus scroll bearing a list of names. The list was a veritable Who's Who of the Christian Right. "Pat Buchanan, Bob Dornan, Jerry Falwell, Fred Phelps, Ralph Reed, Trent Lott..." Jesus read on, as those named followed Him into the clouds. Millionaire cable-TV executive and right-wing politician Pat Robertson smiled gleefully as he slowly climbed the stairs. "I've been waiting for this moment all my life," he said, his three-piece suit shimmering in the beatific glare. "I am going to a place where everybody is like me, filled with Christian love and understanding," said conservative talk-show host and two-time presidential candidate Buchanan. "There will also be a shared hatred of gays." While I don't necessarily share The Onion's animosity toward some of these figures, this satirical story raises a significant question: What's the connection between a first century (bearded, unkempt) Jew and 20th century (well dressed, polished) political conservatives? In other words, just who are Jesus' people? The beginning of the answer to this question is found in the verse cited above: "You shall call his name Jesus, for he shall save his people from their sins." Those who belong to Jesus are those who need to have their sins forgiven. They are sinners. In fact, Matthew himself (the writer of the gospel) was a despised sinner - a tax collector. When Jesus saved him, he gave this famed explanation: "I did not come to call the righteous, but sinners." See Matthew 9 for more details. "Remember, Jesus loves you," said Christ, waving from atop the golden staircase, flanked by Robertson, Buchanan and Falwell, who also waved down to the damned. "So long, suckers!" Falwell exclaimed. This does not mean that Jesus' people remain sinners. Yes, they will sin. But sin no longer defines them, sin no longer enslaves them. After all, they are now Jesus' people.